Preview Gala, the annual benefit for Enterprise for Youth, will open the Show on October 10. This year’s show theme is The Sun, The Moon, & The Stars: Celestial Imagery in Art, Antiques, & Design. Depicted by nearly every culture throughout time, celestial bodies hold mystery, splendor, and symbolism. Glittering, glowing, and geometrically powerful, celestial objects have been popular motifs in art, antiques, design, and literature for centuries. 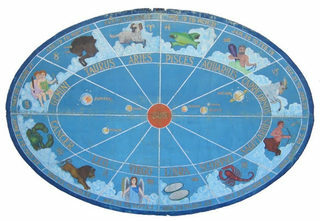 Stars and constellations were named in ancient times for gods and animals they resembled. The sun is regarded as a symbol of life, power, and rebirth; the phases of the moon symbolize immortality, eternity, and purity; stars may represent the knowledge of good and truth, inspiration, imagination, dreams, and divine guidance. The sky humbles us and the celestial elements we see from earth have long been inspiration to artists and artisans. The 37th edition of the Show will feature fifty dealers from around the world, offering for sale an extraordinary range of fine and decorative arts representing all styles and periods including American, English, Continental and Asian furniture and decora­tive objects, paintings, prints, photographs, books, gold, silver and precious metals, jewelry, rugs, textiles and ceramics. Dealers are invited to bring pieces from antiquity to present day. The Show also features a popular Lecture Series, Cocktail Hour Talks and other programming. Enterprise for Youth (http://www.enterpriseforyouth.org) is pleased to present the 37th Show, their major annual fund­raiser. As always, 100% of net proceeds benefit this San Francisco nonprofit that has, since 1969, prepared and empowered a diverse group of Bay Area youth to pursue life after school with passion and purpose. Enterprise offers students intensive workshops, prag­matic skills and career exploration training, a network of advisors and peers, and paid internships in the fields of government, retail, health, tech, design, legal, and more. The Grand Entry Hall will feature four Designer Vignettes created by prominent designers and members of our Designers Circle, each incorporating pieces borrowed from Show Exhibitors as well as a custom designed wall covering exclusively developed in collaboration with de Gournay (http://www.degournay.com/) and the designers.